At St. Jude Children’s Research Hospital, we recently treated a 10-year-old girl with recurrent acute myelogenous leukemia who had undergone a bone marrow transplant. Shortly after the transplant, she developed hepatic-veno-occlusive disease, a condition in which some of the small veins in the liver are obstructed. She was treated with blood thinners, yet her liver function worsened. 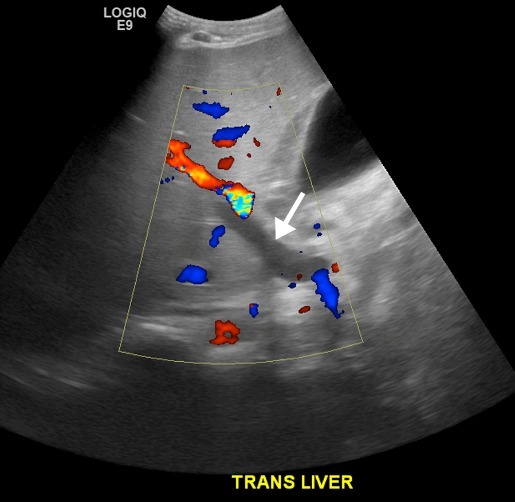 We performed color Doppler and 2-D spectral Doppler ultrasound of her liver to assess the blood flow. The examination revealed an absence of flow in the main portal vein, but it was unclear whether this was due to portal vein thrombosis (a blockage or narrowing of the portal vein by a blood clot) or venous stasis (a risk factor for forming blood clots in veins). Portal vein thrombosis would require delivery of tissue plasminogen activator (TPA) directly into the portal vein while venous stasis could be managed conservatively. In this patient, intravascular TPA carried numerous associated risks and therefore, it was crucial to confirm the presence of thrombus. Because the patient had undergone myeloablation in preparation for bone marrow transplantation, she was thrombocytopenic, coagulopathic and at a high risk of bleeding from invasive procedures such as required for TPA administration. Also, her transplant had induced renal insufficiency. Because of this, she was not a good candidate for any imaging procedure requiring the use of an iodinated intravenous contrast agent due to the potential for toxicity in the kidneys. Moreover, because she was in critical condition, she was not a good candidate for transport to the imaging department for MR angiography. She was, however, an ideal candidate for contrast enhanced ultrasound (CEUS). Ultrasound contrast agents are not metabolized by the kidneys, so they can be safely administered to patients with renal insufficiency. Ultrasound is also a portable modality that can be easily transported outside of the radiology department. We performed a CEUS exam at the patient’s bedside which clearly demonstrated reversal of flow in the main portal vein. In this case, CEUS answered a crucial clinical question while eliminating the need for a risky invasive procedure, avoided the potential nephrotoxicity from iodinated contrast administration, avoided exposing the patient to additional ionizing radiation and avoided transporting a critically ill patient out of the intensive care unit.